Martin Shanahan (right), CEO of IDA Ireland pictured on his recent visit to Galway with Brian Thornton, partner in charge of KPMG’s Galway office. Over the past 36 years, KPMG has made its mark on the West of Ireland and on the business community of Galway. Brian Thornton, KPMG partner in charge of the Galway office, explains. 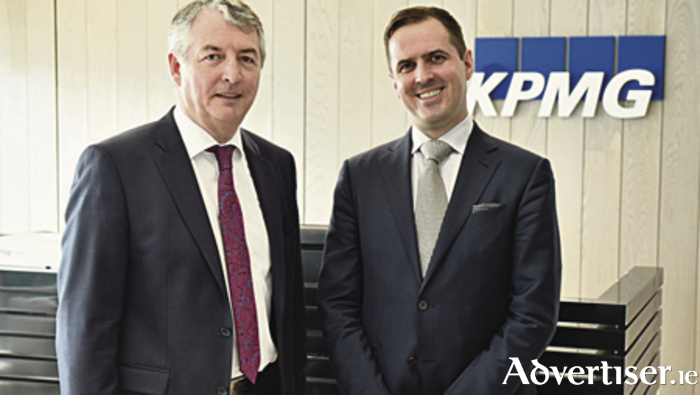 KPMG is the leading business advisory firm in the West of Ireland and its presence in Galway city is now in its 36th year. Our Galway office has over 70 professionals providing audit, tax and advisory services to a wide range of clients in the BMW and Mid West region. When we set up here in Galway in 1980, we knew Galway had great potential and in the intervening years, considerable progress has been made. Over this time, Galway has made great strides in terms of education, tourism and for business - both multinational and as a centre for our own entrepreneurs. Given our location we have always been a trading city and that spirit of entrepreneurship has always been alive and welcome in this city and its Connaught hinterland. Our colleges, our civic leaders and elected representatives, our local government officers and state agencies and most vitally, our business people, have all combined to deliver on Galway’s determination to make its mark. Due to our continued expansion, we have relocated to a much larger premises at Dockgate, Dock Road, Galway. This move reflects our confidence in the region and the continued success of our clients which range from dynamic private and family owned businesses to leading multinationals. We thank those businesses for the confidence they have shown in choosing KPMG to help them achieve their business objectives. We are delighted to have a significant and growing presence in Galway and to be involved in many aspects of life and business in the city. For example, we are actively involved with and support the Galway Chamber of Commerce and Industry and, more recently, its initiative with Galway City Council in developing the Galway City Innovation District (GCID ) and the PorterShed project, of which we are a proud sponsoring partner. In addition, our Corporate Social Responsibility committee provides support throughout the year to various organisations and these activities are both varied and practical. Galway is a very dynamic city and a great place to live and work. The success of Galway has been based on a range of factors from excellent third level education at NUI Galway and the GMIT and to the work of the IDA and Enterprise Ireland in supporting existing businesses and attracting new ventures to the region. This is evidenced by the significant clustering of the Medtech and IT/telecommunications sectors and by the presence of other significant employers in the healthcare, marine, arts and tourism sectors. We are very pleased to be part of that ongoing success story. Our confidence has been epitomised in our role as the home for Connaught Rugby whose performances has galvanised a city and an entire province behind it. It’s that spirit that lies behind the determination of Galway, Connaught and indeed the wider Border, Midlands and West region to thrive. At KPMG, we all sell the virtues of this city and the wider region at every opportunity: our people and their education and skills; our entrepreneurial drive; the support we offer those businesses who chose this great city as their European Gateway to a market of over 500 million people, and the incredible quality of life available here on Europe’s West Coast. We are delighted to be a part of this great success story and we look forward to many more years of success ahead. KPMG is available to assist with all audit, tax and advisory queries and can be contacted at Dockgate, Dock Road, Galway and on 091-534600. DNA Nightclub – Bringing Sax Appeal to Galway City!